The latest episode of Boruto: Naruto Next Generations took a time-out from all the recent drama and action for a nice heartwarming filler episode, titled "Parent and Child Day". When the titular holiday arrives at Hidden Leaf, Naruto takes his daughter Himarwari on the search for a Kurama doll - a journey that makes the two of them the center of the episode. However, as a lot of eagle-eyed Naruto fans noticed, "Parent and Child Day" also had a fun cameo, in the form of the Uchiha family! During one scene along Naruto and Himawari search for the Kurama doll, they stop at an alleyway store, which turns out to be owned by Naruto's old acquaintance Tenten, from the old Team Guy. Naruto tries (and fails) to get Tenten to give him a Kurama doll, but instead all he gets are weapons and trinkets that Himawari will treasure. However, it's on the way into Tenten's shop that we get a nice little secret cameo from the Sasuke Uchiha, and his daughter Sarada! While Sasuke and Sarada aren't involved in this Naruto-centric episode of Boruto, some upcoming episode previews reveal that the Uchihas will in fact be getting their own daddy-daughter chapter of this larger "Parent and Child Day" arc - specifically episode 95, "Daughter & Icha-Icha Epic Battle", on February 24th! Episode 95 Synopsis: "The village is bustling with people because of the 'Family Day' events. Sasuke encounters Boruto, who's been strolling along. When he hears about the new 'Family Day' holiday from Boruto, he reminisces about his childhood. Sasuke then sets off to spend it together with Sarada. Even though Sasuke is trying to make his daughter happy, Sarada just feels embarrassed about him. Meanshile, someone appears in front of Sasuke to suggest some help: It's his former Shishou, Kakashi!" 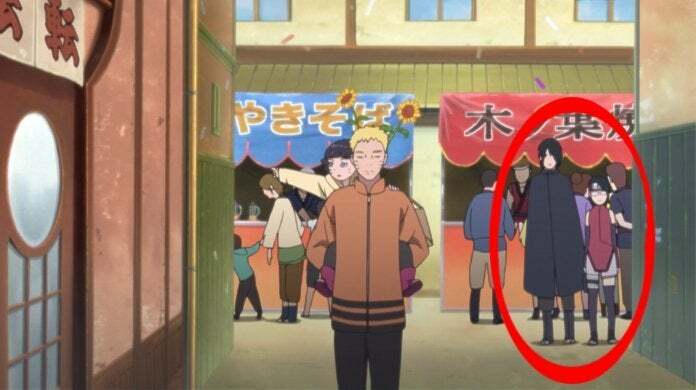 One has to wonder why Sasuke and Sarada are appearing in front of Tenten's shop. Knowing the kind of dad Sasuke is, there's almost certainly some kind of weapon in the shop that Sasuke will use as a bonding experience with Sarada, who is just as intensive and focused as her father. Seeing those two trying to bond over Parent and Child Day will be more rewarding than the awesomeness that was this Naruto and Himawari team-up!